Tim acts like an older brother to his sister Tiffany, despite the fact that he was born three minutes after her. He is strangely overprotective of her, and is constantly making sure that she's okay. He is very moody, often depressed, and looks at the world through jaded, cynical eyes. His one joy comes from listening to rock music. He is particularly fond of KISS; he has all their CDs and has even met some of the members. Tiffany is cheerful, happy-go-lucky and childish. Not only is the glass constantly half full for her, but it's also pink with smiley faces drawn on it. She is obsessed with stuffed animals, of which she has many, and believes that she can always get her way by saying "Please!" often enough. Tiffany is always trying to get her brother Tim to have fun, which usually consists of a game of Candy-Land. 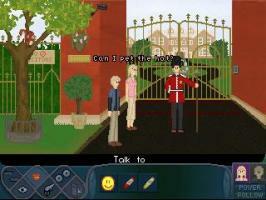 This game was originally made for the AGS Team Competition, which ran for six weeks in the summer of 2004. The team consisted of BerserkerTails, Dart, Scotch, Yoke and myself. We managed to make the deadline, but decided that the game was still too empty and full of bugs to justify an official release. Three-and-a-half months later, it's sweet and sparkly and ready for public consumption. Creating this game has been a fantastic experience. We all hope you enjoy it. This is a pretty fun game that I think most people who like a game with some comedy in it would enjoy. Very interesting characters, completely believable dialogue, plenty of blue cup jokes. The only issue I had was sometimes during scaling the sprites would show at a higher resolution than the background. While this makes the sprites more recognizable, it makes them "pop" off the background a little too much for my tastes. Overall, a wonderful game I would recommend to anyone! Hurray! I've completed this game at last. I downloaded it once before and got completely stuck very early on. I'm glad I gave it another chance. Great game! It was nice. What a great job!! I really love the dialogue that acually express each character's view towards the problem. Reasonably good point and click. Fairly easy in parts and not without the occasional bug here and there (be sure to save between puzzels). Its interesting to note the obvious influence of Sam and Max in this game. Both games had two characters; abstract graphics in parts and a place map sort of environment which is not so common in other point and clicks. The story line is fairly similar to 5 days a stanger, another obvious influence. All in all I'd say this game was rather unorginal but still a good play. The puzzels were interesting but not difficult and fairly shallow. The interface also needs work. 7/10 - Thank you for the game, keep up the good work! - The intro's story does nothing else than to justify the characters special powers and has no effect on the actual game-story. + Nevertheless, the special powers were nice features. - The sprite-animations, especially Tiff's walkcycle, could have been better. +The music was very nice. In my opinion the best part of the game. - How was I supposed to know, you could USE the Antenna-Device ? I expect my character to inform me about a switch on a device, when I LOOK at the device. Even the whole electrocute the bird thing was not logical. - The whole bunny-slippers and head band puzzle. - I hate it when I tried a particular thing which my character refused to do, and later in the game the exact thing is the solution of a puzzle. I think about doeing it, but remember that it did not work earlier. In this game it was the demon-teleportation. I knew I have to draw a circle and stuff somewhere, I knew I had to float to the demon, but I remembered I couldn't use SMILEY with PEN earlier. Nevertheless, a GOOD GAME, worth playing. And always remember : It was for free ! I deaply enjoyed the game... but... OK, I almost deeply enjoyed it. ItÂ´s so buggy it made me want to kill myself. IÂ´m nto talkig about the non responsive interface (which was frustrating enoug), but sometimes I switched twins, and the characters were not where I left them, but standing on a non-wakable area which made them stuck forever, unable to move... restart! I have to say, was the game an inch les enjoyable, I wouldnÂ´t have finished it. Though it's not something common for me to do, I felt the need to congratulate Epileptic Fish for the nice piece of game they have given us all. I'd like to start by saying that the game in itself is S-O-L-I-D. Fluid gameplay, the pace is constant and there's no feeling of rush at any moment. Puzzles are rather interesting, while the game is not incredibly hard, it makes sure that nothing is really TOO evident. Dialogues are a strong point here, every character with its own feelings and ways that adds to the whole in the game. Characters are well developed, giving away just the right ammount of info needed for a game of that length. Backgrounds are nicely depicted, there's no pixel-hunting at all which makes the experience much less frustrating and sprites suit well with them, that's another example that top-notch graphics are not needed to create an atmosphere... which takes me to the best part of it all: The music. I've realized that movies and games I loved throughout my life always had a great soundtrack to support them. While as you could easily say that we get attached to music because we relate them to emotive scenes/nice performances, I do think that it's the music itself that makes the magic happen and without it, the effect would be terribly lessened. That's why I found myself smiling more than once while travelling through "two of a kind" world. You will find out that tunes and backgrounds seem to be made one for each other and that they enforce the plot to a great level. Just brilliant. Two thumbs way up. Finally I'd like to praise Allister Howe for the masterpiece ending theme "Itchy eyes". I got in love with the song and I found out that I couldn't press Alt+F4 even though the "The End" screen had been there for quite a lot of minutes. I highly recommend the game to all adventure gamers, and if you have well-developed feelings, you'll not only get really involved with the characters, but also you will feel nostalgic when you finish the game, because you'll never want the story to be over. We're expecting lots of releases from Dave, Allister and the rest of you. That's a team with a lot of potential if I ever saw one. This is an extremely enjoyable game with two charming, likeable and well-written main characters. The conversations are very funny, the side characters all have distinctive personalities, and the puzzles are fun to solve. The attention to detail is fantastic in this game, especially considering that many objects and actions need to be described twice. I like the sense of cooperation in this game and the relationship between the twins is well portrayed. Minor niggles are that the interface is slow to respond (but it might be my old computer) and there are a couple of screens where the characters' walking speed is extremely slow (again, it might be my computer). Anyway, it definitely is worth a download!